I made some chalk paint for Billy(7) and Boadie(5) today! They loved it! 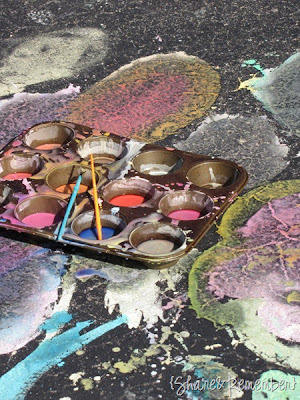 The boys pretended to be battling wizards and splattered this magic (chalk) all over the street with their wands (paint brushes). This entry was posted in DIY, Uncategorized and tagged Kiddos. We had great fun with this today! We have cement squares in the backyard, turned my head for 2 seconds and someone was painting the house…. So glad this washes right off, thank you for sharing! Haha too funny. I'm glad it came off the house! Yikes! Have fun with those kiddos!